As Pink’s 2nd birthday was approaching, I had an idea. 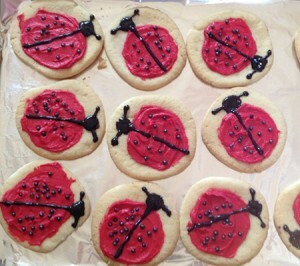 I was going to give her the coolest ladybug party ever. Then I realized two things. One, she doesn’t like crowds of people. Two, I’m not so great at DIY projects (and I’m not nearly organized enough to order cool stuff in enough time). So, I got real. 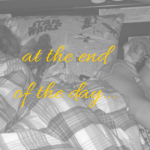 I came up with some simple ideas that even a clumsy ol’ mom like me could execute (for a small group of family and a few friends). And if I could do this stuff, just imagine what you could do with my ideas (and Pinterest). I mean, wow! 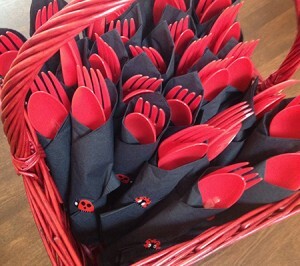 Since I couldn’t find ladybug themed plates or napkins at the party store, I just bought red and black items, then sealed the napkins with a ladybug sticker. 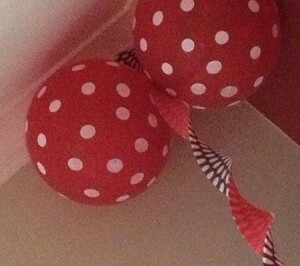 I kept it simple using red polka dot balloons and combining plain red with black and white polka dot streamers. 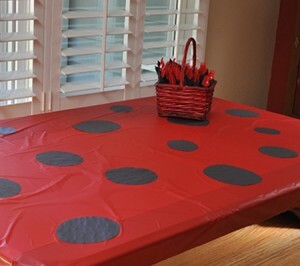 To personalize the decor, I made simple construction paper ladybugs. I cut out 24 bodies (I made 8 per sheet of construction paper) and 96 lovely little legs. 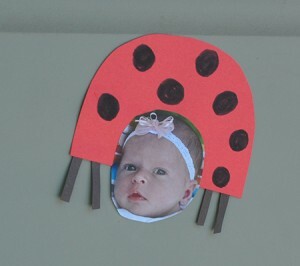 Then, I found a sweet picture from each month since she was born and glued it on as the ladybug face. After that dried, I turned it over and drew a line of glue along the bottom and stuck 4 of the little legs on. The next morning, I drew the dots with marker, but if I’d been more organized, I might have even gone all Pinterest-y and used Pink’s fingerprints. (Ok, I wouldn’t have, but you could.) As I was doing this in an extremely imperfect fashion, I decided I was channeling my inner Eric Carle — we love him and his whimsical approach to animals. So, yeah, imagine that. 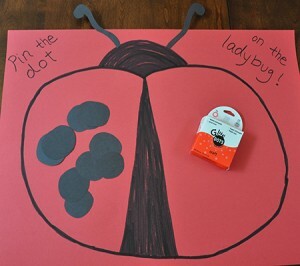 While I’m not big on party games, I decided to make a Pin the Dot on the Ladybug game. I bought a sheet of red poster board and drew the ladybug with a kid’s marker. I cut out dots from black construction paper, then as I handed one to each kid, I attached a glue dot for stick. It turned out this was a great way to get the kids to stop running around come dinner time. 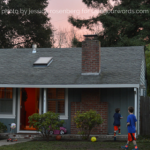 The real thrill — for kids and adults alike — was gathering ladybugs. 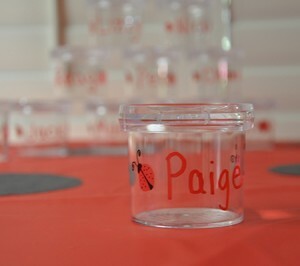 I gave each child their own bug jar, then opened a package of 1500 ladybugs that I bought at a local gardening shop. 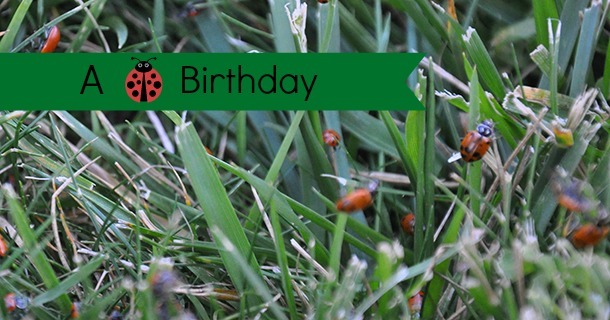 (Note: Depending on the season, you can also buy ladybugs online. You simply store them in the refrigerator until about an hour before you’re letting them go. They become more active once they’re out and ready to roam the garden.) 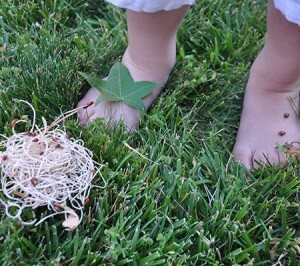 I found that it worked well to spread them out along the grass so the kids weren’t all on top of each other. After they gathered them in their jars, I explained that they could take them home and set them free in their gardens because they help take care of the plants. One really simple way to carry the theme into the menu is with a veggie platter. 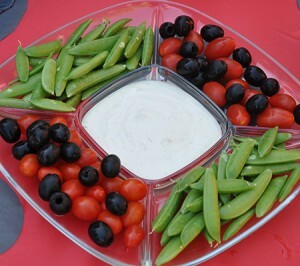 I’m sure this could have been done in a much more elaborate way, but cherry tomatoes, olives, and snap peas are all favorites around our house, so I went with it. As I mentioned, I gave each child a bug collection jar. I found some cute little ones at the local school supply store for $2.99 each, then I used paint pens to write each name and draw little ladybugs. So, it wouldn’t be an event I planned without a few ideas not fully executed. Here were the things I wanted to do…if only I’d had about two more weeks to prepare. • Cut the tops off strawberries and lay them on the cut side. 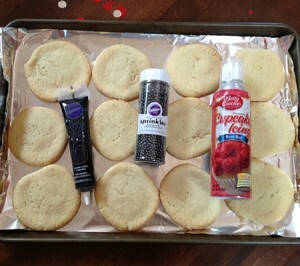 Then stick some mini chocolate chips in for ladybug spots. • Buy red and black M&Ms, or little red and black licorice strips and put them on the table in clear bowls. 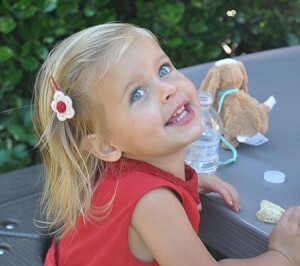 And, the most important thing of all… Enjoy your sweet little ladybug! how totally awesome!!! and way more up my alley than any minecraft party I’ve attended! well done, Amy! 🙂 And Happy Birthday (belated) Pink! So adorable! I just love the cookies!